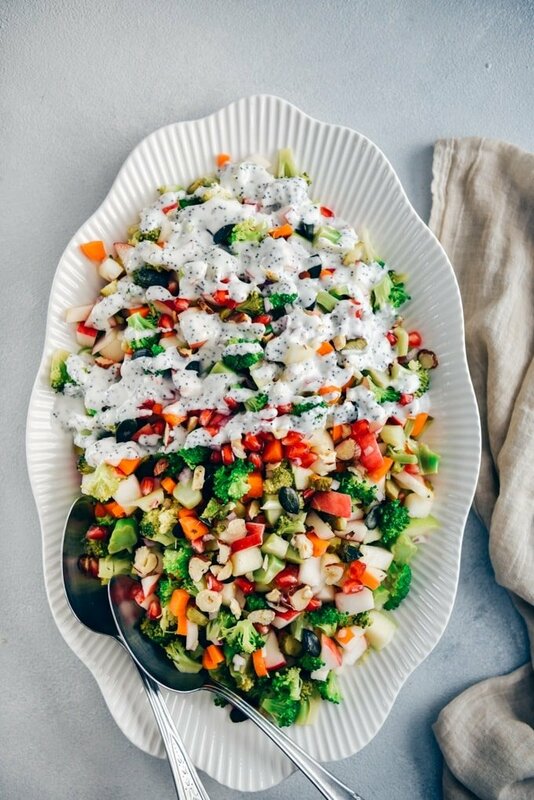 This light, colorful Broccoli Apple Salad is perfectly balanced and packs a ton of nutrients. Better yet, it’ll be ready in 10 minutes, including the creamy yogurt dressing! I love a good salad and this one is my ideal fall dish. At this point in the season we’ve used apple in every possible way: cakes, muffins, applesauce, apple butter, pies, crumbles, the list goes on. Just type ‘apple’ in the search box on top of the page and check the apple recipes. Most of them are sweet and I’d start with the Healthy Apple Muffins. On the other hand, it’s easy to overlook savory options and this Broccoli Apple Salad is the perfect example. Not only is it bright, crispy and full of flavor, it’s also versatile. Add a grilled chicken breast to make it a full meal like our Chicken Salad with Apples or serve it as a side when you’re entertaining friends and family around a holiday table. My favorite thing about this Broccoli Apple Salad is how fast and easy it is to make. The hazelnuts, pumpkin seeds and pomegranate add a layer of sophistication that will make everyone think you spent much more time on it than you did. I like to make the dressing first so it’s ready when I finish prepping the salad ingredients. It’s super simple to stir everything together. Just make sure to taste it and add more pickle juice if needed. 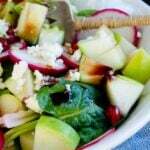 When you prepare the salad ingredients, you don’t have to wait until the last step to cut the apple to avoid browning. Instead, try squeezing a few drops of lemon juice over the slices immediately after cutting. Alternately you can fill a bowl with water, add lemon juice to it and place the apple slices in the water. Blanching is a great process for cooking vegetables or fruits that allows them to retain their texture, color and fresh flavor. Before you begin, fill a large bowl with cold water and add a few ice cubes to chill it completely. Set the bowl aside but keep it close by as you’ll want to transfer the broccoli florets directly from the stove to the bowl. Next, make sure your pot of water is fully boiling (sometimes called a rolling boil) and add the broccoli. Cook for just 2 minutes and then transfer to the ice water using a slotted spoon. You’ll notice that the broccoli looks extra bright green which is exactly what you want. Let it cool completely in the cold water. Then drain it and spread the broccoli out on a clean kitchen towel to dry before adding it to the broccoli and apple salad. Like many salads, this Broccoli Apple Salad is pretty flexible. The hazelnuts can be replaced by pecans or cashews. If you want to avoid using nuts altogether, use sunflower or pumpkin seeds. Cranberries are a great alternative to pomegranate. And any of the salad ingredients can be left out if needed due to allergies. Whether you’re eating it for lunch at your desk or cooking for lots of friends and family, I hope you enjoy making this crunchy delicious fall salad! Please rate the recipe and leave a comment below if you make this Broccoli Apple Salad Recipe! Want more side dishes to pair with your meals during the holiday season? This plate looks so tempting 😍 I usually make salad for my breakfast and yours seems a good option for me 🙂 Especially the yogurt dressing! I will try it soooon!